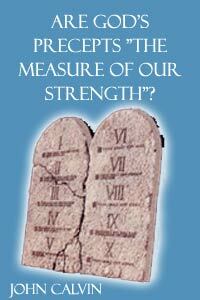 Are God's Precepts "The Measure of our Strength"? Our opponents take great pains to heap up Scriptural passages: and they do this so unremittingly that, although they cannot prevail, in the numbers at least they can bear us down. But as in battle, when it comes to a hand-to- hand encounter an unwarlike multitude, however much pomp and ostentation it may display, is at once routed by a few blows and compelled to flee, so for us it will be very easy to disperse these adversaries with their host. All the passages that they misuse against us, when they have been sorted out into their classes, group themselves under a very few main headings. Hence one answer will suffice for several; it will not be necessary to dispose of each one individually. They set chief stock by God's precepts. These they consider to be so accommodated to our capacities that we are of necessity able to fulfill all their demonstrable requirements. Consequently, they run through the individual precepts, and from them take the measure of our strength. Either God is mocking us (they say) when he enjoins holiness, piety, obedience, chastity, love, gentleness; when he forbids uncleanness, idolatry, immodesty, anger, robbery, pride, and the like; or he requires only what is within our power. Now we can divide into three classes almost all the precepts that they heap up. Some require man first to turn toward God; others simply speak of observing the law; others bid man to persevere in God's grace once it has been received. We shall discuss them all in general, then we shall get down to the three classes themselves. A long time ago it became the common practice to measure man's capacities by the precepts of God's law, and this has some pretense of truth. But it arose out of the crassest ignorance of the law. For, those who deem it a terrible crime to say that it is impossible to observe the law press upon us as what is evidently their strongest reason that otherwise the law was given without purpose. Indeed, they speak as if Paul had nowhere spoken of the law. What then, I ask, do these assertions mean: "The law was put forward because of transgressions" [Galatians 3:19, cf. Vg. ]; "Through the law comes knowledge of sin" [Romans 3:20]; the law engenders sin [cf. Romans 7:7-8]; "Law slipped in to increase the trespass" [Romans 5:20, cf. Vg.]? Was the law to be limited to our powers so as not to be given in vain? Rather, it was put far above us, to show clearly our own weakness! Surely, according to Paul's definition of the law, its purpose and fulfillment is love [cf. 1 Timothy 1:5]. And yet when Paul prays for the hearts of the Thessalonians to abound with it [1 Thessalonians 3:12] he fully admits that the law sounds in our ears without effect unless God inspires in our hearts the whole sum of the law [cf. Matthew 22:37-40]. Of course, if Scripture taught nothing else than that the law is a rule of life to which we ought to direct our efforts, I, too, would yield to their opinion without delay. But since it faithfully and clearly explains to us the manifold use of the law, it behooves us rather to consider from that interpretation what the law can do in man. With reference to the present question, as soon as the law prescribes what we are to do, it teaches that the power to obey comes from God's goodness. It thus summons us to prayers by which we may implore that this power be given us. If there were only a command and no promise, our strength would have to be tested whether it is sufficient to respond to the command. But since with the command are at once connected promises that proclaim not only that our support, but our whole virtue as well, rests in the help of divine grace, they more than sufficiently demonstrate how utterly inept, not to say unequal, we are to observe the law. For this reason, let us no longer press this proportion between our strength and the precepts of the law, as if the Lord had applied the rule of righteousness, which he was to give in the law, according to the measure of our feebleness. We who in every respect so greatly need his grace must all the more reckon from the promises how ill-prepared we are. But who will believe it plausible (they say) that the Lord intended his law for stocks and stones? No one is trying to argue thus. For the wicked are not rocks or stumps when they are taught through the law that their lusts are opposed to God and they become guilty on their own admission; nor are believers stocks and stones when they are warned of their own weakness and take refuge in grace. On this point these profound statements of Augustine are pertinent: "God bids us do what we cannot, that we may know what we ought to seek from him." "The usefulness of the precepts is great if free will is so esteemed that God's grace may be the more honored." "Faith achieves what the law commands." "Indeed, it is for this reason the law commands, that faith may achieve what had been commanded through the law. Indeed, God requires faith itself of us; yet he does not find something to require unless he has given something to find." Again, "Let God give what he commands, and command what he will." This will be more clearly seen in reviewing the three classes of precepts that we have touched on above. (1) Oftentimes both in the Law and in the Prophets the Lord commands us to be converted to him [Joel 2:12; Ezekiel 18:30-32; Hosea 14:2 f.]. On the other hand, the prophet answers: "Convert me, O Lord, and I will be converted... for after thou didst convert me I repented," etc. [Jeremiah 31:18-19, Vg.]. He bids us circumcise the foreskin of our heart [Deuteronomy 10:16; cf. Jeremiah 4:4]. But through Moses he declares that this circumcision is done by His own hand [Deuteronomy 30:6]. In some places he requires newness of heart [Ezekiel 18:31], but elsewhere he testifies that it is given by him [Ezekiel 11:19; 36:26]. "But what God promises," as Augustine says, "we ourselves do not do through choice or nature; but he himself does through grace." This observation he lists in fifth place among the rules of Tychonius: we must distinguish carefully between the law and the promises, or between the commandments and grace. Now away with those who infer from the precepts that man is perhaps capable of obedience, in order to destroy God's grace through which the commandments themselves are fulfilled. (2) The precepts of the second kind are simple: by them we are bidden to honor God, to serve his will and cleave to it, to observe his decrees, and to follow his teaching. But there are countless passages that bear witness that whatever righteousness, holiness, piety, and purity we can have are gifts of God. (3) Of the third type is the exhortation of Paul and Barnabas to believers "to remain under God's grace," referred to by Luke [Acts 13:43]. But Paul also in another place teaches the source from which that virtue of constancy is to be sought. "It remains, brethren," he says, "for you to be strong in the Lord." [Ephesians 6:10 p.] Elsewhere he forbids us to "grieve the Spirit of God in whom we were sealed for the day of our redemption" [Ephesians 4:30 p.]. Since men cannot fulfill what is there required, Paul asks of the Lord in behalf of the Thessalonians to "render them worthy of his holy calling and to fulfill every good resolve of his goodness and work of faith in them" [2 Thessalonians 1:11 p.]. In the same way Paul, dealing in the second letter to the Corinthians with alms, often commends their good and devout will [cf. 2 Corinthians 8:11]. Yet a little later he gives thanks to God, "who has put in the heart of Titus to receive exhortation" [2 Corinthians 8:16 p.]. If Titus could not even make use of his mouth to exhort others except in so far as God prompted it, how could others be willing to act unless God himself directed their hearts? The craftier of our opponents quibble over all these testimonies, holding that nothing hinders us from bringing all our strength to bear while God supports our weak efforts. They also bring forward passages from the Prophets in which the carrying out of our conversion seems to be divided equally between God and ourselves. "Be converted to me and I shall be converted to you." [Zechariah 1:3.] What assistance the Lord provides us has been demonstrated above, and there is no need to repeat it here. I wish this one thing at least to be conceded to me: it is pointless to require in us the capacity to fulfill the law, just because the Lord demands our obedience to it, when it is clear that for the fulfillment of all God's commands the grace of the Lawgiver is both necessary and is promised to us. Hence it is evident that at least more is required of us than we can pay. And that statement of Jeremiah cannot be refuted by any cavils: that the covenant of God made with the ancient people was invalid because it was only of the letter; moreover, that it is not otherwise established than when the Spirit enters into it to dispose their hearts to obedience [Jeremiah 31:32-33]. Nor does this sentence lend support to their error: "Be converted to me and I shall be converted to you" [Zechariah 1:3]. For God's conversion there signifies not that by which he renews our hearts to repentance, but that by which he testifies through our material prosperity that he is kindly and well disposed toward us, just as by adverse circumstances he sometimes indicates his displeasure toward us. Since, therefore, the people, harassed by many sorts of miseries and calamities, complain that God is turned away from them, he replies that they will not lack his lovingkindness if they return to an upright life and to himself, who is the pattern of righteousness. Therefore they wrongly twist this passage when they infer from it that the work of conversion seems to be shared between God and men. We have touched this matter the more briefly because its proper place will be under the discussion of the law.